Do you have acne-prone or oily skin? Then Zenith Skincare’s Dermafresh Face Scrub might be what you need. This product combines the efficacy of dermabrasion crystals, alpha hydroxy acids (AHAs), and fruit enzymes to remove dead skin cells. It also purifies the pores to prevent the development of acne without over drying your skin. At the same time, this face scrub moisturizes your skin and inhibits the overproduction of grease. As dead layers of skin are removed from your skin, your moisturizer and face serum will penetrate easily. This Dermafresh face scrub has a nice tropical scent that will instantly lift your mood. Its scent might be a little similar to piña colada and vanilla. It has a sweet scent that makes you want to apply it frequently, although it’s recommended to use it only 2-3 times a week. The best thing about this face scrub is that it combines three amazing exfoliating agents: microdermabrasion crystals, AHAs, and fruit enzymes. Together, they effectively remove the dead skin that makes your face look dull and old. This is quite an advantage when compared to other face scrubs which only use one type of exfoliating agent. The aluminum oxide crystals are so fine that rubbing them on your face in circular motions won’t hurt. The fruit enzymes like papaya, pineapple, and pumpkin extracts are all natural, so putting them on your face won’t be irritating. Best of all, this product doesn’t contain any parabens and sulfates which can be toxic for your health. It is also contains no alcohol, which can dry out your skin. Aside from the soft and glowing skin that you will get from this product, you’ll also be able to solve your acne problem. With salicylic acid, the bacteria that cause pimples will be killed before they can create havoc on your face. The pineapple extract can also help control the overproduction of grease on your face. A few users noted that this face scrub is too small a quantity for their satisfaction. The product only contains 60 ml, which is a bit meager for their needs. Since this product is recommended to be used 2-4 times a week, 60 ml is quite a small amount. If you find this a deal breaker and want a larger volume, you could try the Organic Microdermabrasion Facial Scrub Exfoliator from Honeyskin Organics. Some customers reported an aversion to aluminum oxide. Although these microdermabrasion crystals are gentle and effective, they are known to be neurotoxins. They also have negative effects on the environment. If you have fears about the risk of aluminum oxide to your health, you can try other brands which offer natural exfoliating agents. For instance, Organic Exfoliating Facial Sugar Scrub from Bee Friendly Skincare uses organic cane sugar as an exfoliating agent. A few customers reported that the face scrub is not effective in removing fine wrinkles. It might take time for this product to show results in removing wrinkles; if you have wrinkles, you can follow this face scrub with a good moisturizer. As dead skin cells are removed from pores, your moisturizer will easily penetrate. Dermafresh Face Scrub and Bee Friendly Skincare’s Organic Exfoliating Facial Sugar Scrub have different microdermabrasion ingredients. While Dermafresh uses aluminum oxide crystals, AHAs, and fruit enzymes, Bee Friendly Skincare uses organic cane sugar. Dermafresh is not fragrance-free, unlike the other brand, but it has salicylic acid which can help prevent acne. In comparison to Candid Essentials’ Best Advanced Microdermabrasion Scrub, Dermafresh has salicylic acid which can be used for acne-prone skin. 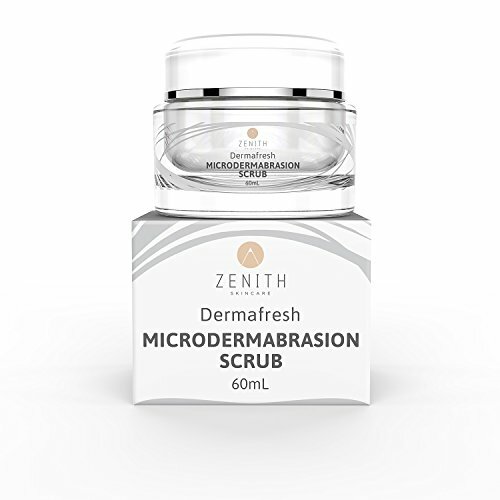 While Dermafresh uses exfoliating fruit enzymes, Best Advanced Microdermabrasion Scrub uses natural moisturizing ingredients, like jojoba and avocado oils, and shea butter. Dermafresh is alcohol-free, but Best Advanced is fragrance free. Both have the same volume, 60 ml. Dermafresh Face Scrub might be a great solution for those who have acne-prone and sensitive skin. Although it uses aluminum oxide crystals, it is not a deal breaker because it is safe to apply to the skin as long as you don’t swallow it. It also uses other great exfoliating agents, like AHAs and fruit enzymes, so you can expect good results.